Types of Art: The reliquary figures of the Kota may be distinguished from their neighbors by the copper overlay on them. 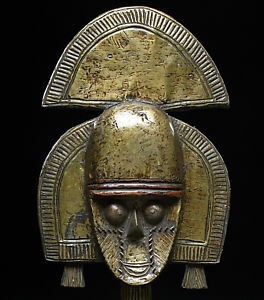 Some masks are found in collections, but these are extremely rare. Other utilitarian objects, such as pots, baskets, stools, and knives were often decorated with delicate patterns. Religion: The traditional religion of Kota centered around ancestors who are believed to wield power in the afterlife as they had as living leaders of the community. The skulls and long bones of these men were believed to retain power and are said to have control over the well-being of the family of the relics' keepers. Usually the relics were kept hidden away from the uninitiated and women. Wooden sculptures covered with sheets of copper and brass, known as reliquary or guardian figures, were attached to the baskets containing the bones. Some believe that the figures are an abstract portrait of the deceased individual, while others argue that they are merely to protect the spirit of the deceased from evil. It must be remembered, however, that it was the bones themselves that were sacred, not the wooden figures, thus there is no apparent contradiction to individuals selling what in effect was the tombstone of their ancestors for considerable profit to art dealers. During migrations the relics were brought along, but the reliquaries were often left behind.